The wedding ceremony is complete, and it is now time to celebrate in style, with family and friends. Welcoming the groom and the bride, as newlyweds is a crucial part of the wedding. So, why not spice up the grand entrance of the couple as man and wife for the first time? A warm welcome to the couple will set the tone for the reception party. Make it an unforgettable entrance for them. Here are some ideas to give a lovely welcome to the newlyweds after they have just tied the knot. What’s more? You can also use these tips to welcome the bride and the groom during the pre-wedding functions, like the engagement or cocktail night. 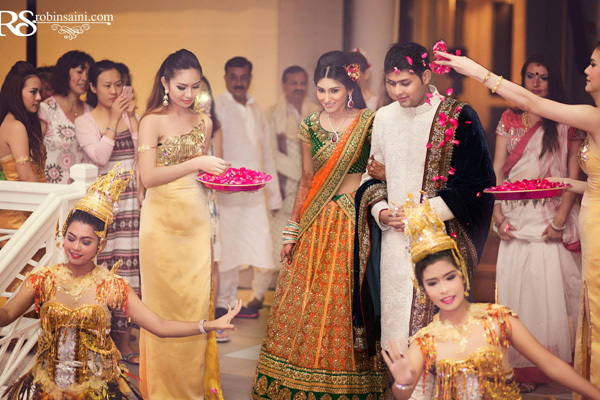 It is just about making their entrance as special as the evening, so it doesn’t matter whether it is a pre-wedding ceremony or post-wedding. This is a common way to welcome the couple at Indian weddings. You can use fresh flower petals of different hues to create a wonderful effect. While the traditional way has been to shower only red coloured rose petals, a little experimentation with other seasonal flowers and a combination of light and dark hues would just uplift the evening. Using flower petals enhances the wedding decor and adds to the gaiety of the event. It would add immeasurably to your wedding pictures too! This works wonders for any wedding function, especially in an outdoor setting. As the couple gets ready to begin a new chapter in their lives, kids and adults can both get together to give a “bubbly” welcome to them. It creates a wonderful effect and offers excellent photography options. 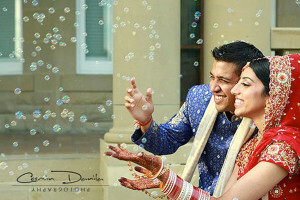 The grand entrance is the moment for them to shine and revel in the excitement of being a newly married couple. This is a good option that goes well for both an outdoor as well as an indoor welcome. While using confetti is a common choice, you can make it special by showering personalised confetti that carry sweet messages. Delight everyone around with this novel welcome idea. What’s more? You can shower dried flower confetti in beautiful colours to make the moment even more special. Particularly suited for an evening celebration, this is a wonderful way to celebrate the special day. 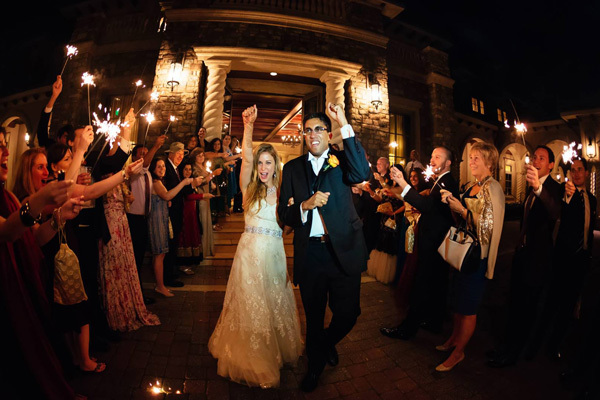 Pump up the entrance of the couple with bright sparklers. You can also use this idea to give the lovely couple a warm exit as well, after the ceremonies are over. Whatever way you choose this idea, just be careful if there are kids around. 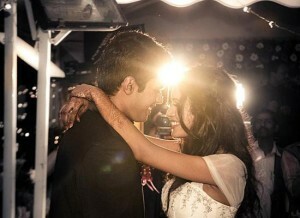 If you want to make sure that all the eyes are nowhere else but on the lovely couple, then use a spotlight to follow them as they enter the venue. As the rest of venue goes dark with dim lights, let the newlyweds make their way through the crowd in a truly filmy style with the help of a spotlight. Instead of one big spotlight, you can have a couple of smaller lights, lighting up the path through which they enter. It is really the little things about a wedding event that makes it so special and enjoyable. These welcome ideas add that extra something to a wedding. Before the couple arrives, set the stage for the welcome. To further the excitement quotient, you can also hire professional dancer to welcome the newlyweds, along with one of these ideas. Pick the right kind of music to go with your creative welcome idea. Coordinate with the photographer and inform them beforehand about the idea. Ask the photographer to be ready to shoot some great shots. 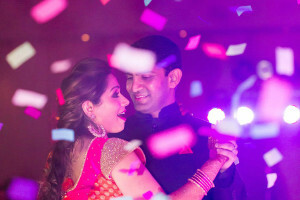 A wedding is all about fun and colourful celebrations. It is time for the couple to celebrate the fact that they are married. Every couple is unique, so first decide what kind of welcome would suit them the most. With a little bit of pomp and flourish, you can create a wonderful thrill. A little bit of creativity can go a long way towards making it a memorable welcome for everyone.